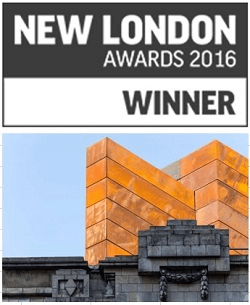 We are delighted to share the news that the Shaftesbury Theatre project are now the recipients of the New London Architecture Award for the Best Cultural and Community development in London. Presented to the Theatre and Bennett’s Associates, the award recognises the Theatre’s Fly Tower extension which was completed at the beginning of March. In a statement about the nominees in the Culture and Community category, judge Peter Murray explained that “this year’s winner, the Shaftesbury Theatre, represents an ‘absolutely stunning addition to the townscape’, with its new fly tower making an enormous difference to events the previously threatened – and temporarily dark – theatre can put on”. He went on to add “that it was a ‘great intervention and a real surprise to see it there. It seems to fit perfectly.’”. As ever, our thanks and congratulations go to our architects, Bennett’s Associates, and everyone involved in the project.